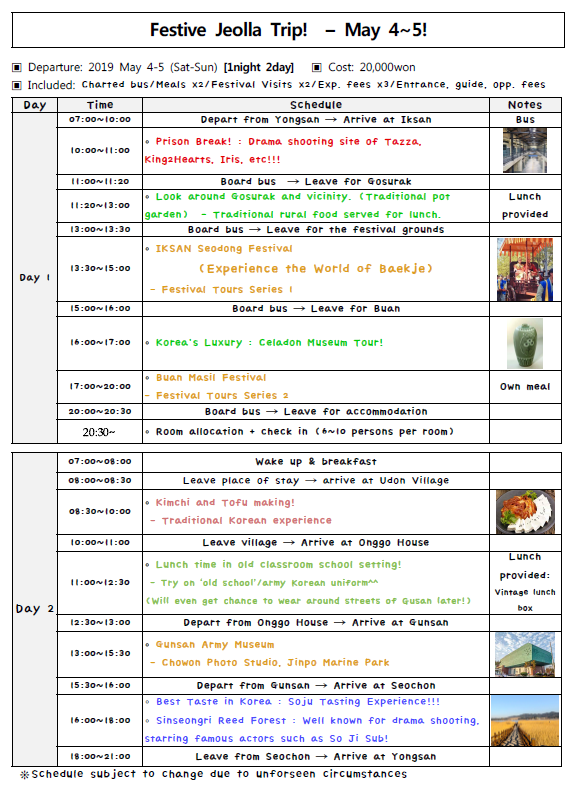 * Tour Gongbang (Tour 08) Co., Ltd. ((주)여행공방 is a registered travel agency based in Yongsan Seoul & is responsible for the management/part funding of this trip. ※This tour is partly sponsored by the local provinces visited. ***This sign up form is for HUFS students. As we are in collaboration with the HUFS student office in order to make it possible for departure from HUFS university. Anyone feeling festive this Spring? Well, you should be! As South Korea dolls itself up with flowers and abundant sunshine, various provinces prepare themselves for festivals and events that attract thousands each year! Tour 08 presents, Festive Jeolla! A fun packed weekend away in the ancient province of Jeolla, known for it's historic artifacts, ruins, festivals and sceneries! Leave that pitcher behind in Hongdae or Itaewon and come join us on this culturally enriching experience , with a setting that's more than 2000 years old. *First to sign up and make payment! Place will not be confirmed until payment is made. **If departure doesn't happen for what ever reason you will be refunded the full amount. ▶Gosurak (Beautiful garden with traditional fermenting pots). Local meal will be had here. ▶'Urimil' Village for Kimchi and Tofu making exp. ▶'Onggo House' for a vintage Korean experience of the good old days + vintage lunch box! ▶Traditional Rice Wine tasting experience! + Visit to Sinseongri Reed Village (another famous filming site).